Nothing epitomises February like snowdrops. Before bluebells, crocus or daffodils ever appear; these hardy plants can be seen springing up in many churchyards and on grass verges, even if they have to poke their little bell-shaped white blooms through the snow. It lightens the heart to see snowdrops, showing us all that no matter how cold it still is, spring really is on its way. If you didn’t quite get it right on Valentine’s Day, a snowdrop walk would make a great romantic gesture. The best local place to see snowdrops by the thousand has got to be Welford Park, about a thirty minute drive west of Reading. The directions on the website www.welfordpark.co.uk suggest taking the M4 to Junction 13, but a better way would be to follow the old coaching road of the A4, offering plenty of opportunity to stop for lunch at one of the many historical hostelries lining the route. The park is well sign-posted, situated just past the village of Wickham, very picturesque in itself with its chocolate-box thatched cottages. You’ll certainly know when you’re near, as the clumps of snowdrops by the roadside become steadily denser. Welford Park is open 11am to 5pm from Tuesday to Thursday and 2pm to 5pm on Sundays throughout February. Admission is £3.50 for adults, £2.50 for concessions and by donation to a different charity every Sunday. The approach to the house is stunning in itself. It’s only when you walk up the grand driveway that you start to appreciate the sheer volume of flowers there. There’s a carpet of white for as far as the eye can see, with only occasional specks of tiny yellow and blue buds starting to appear amongst them. 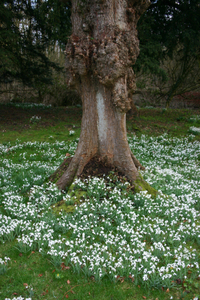 Snowdrops encircle gnarly tree trunks, drop down river banks and decorate grass verges. Blankets of them appear to have fallen all around. The effect is breath-taking, if you’re a fan of these tiny flowers, you will love the romantic, if muddy walk along the River Lambourne, following the local Aylesbury ducks down to the Rookery. On the day we visited, it was sunny, but bitterly cold, so do wrap up very warm if you’re intending to walk the entire route. After all this exercise, there’s only one place to head for, the warm, welcoming interior of the tea room in the Old Laundry. Here massive portraits of previous owners hang amidst racks of antlers on the walls, overlooking a selection of seating from communal trestles to tiny intimate tables for two. They offer an impressive selection of cakes and pastries - a cream tea with a good strong cuppa costs a reasonable £2.75, it’s just a pity that the tea comes served in a polystyrene cup. The same building houses the gift shop too, where you can purchase postcards in case your photos don’t come out, tea towels for an early Mother’s Day gift or home-made marmalade for lazy Sunday mornings. You can even take a tub of five snowdrop bulbs home for £2, in case you fancy starting your very own Welford Park next year.